I did two 7.5 mile runs during the week, to and from work, only 12 hours between then. The first run is 90% effort, so the following morning I'm not really recovered, and even though I run it at an easy pace with a light backpack, this week I found it a little tiring. I also felt I had a tight IT band on my right leg, so rather than chance it, I didn't do my 3 mile flat-out speed work on Thursday night. I just did my gym session and left it at that. I had my girlfriend do some impromptu sports massage on my lower back, because I know from experience it is a tight lower back that pulls my pelvis up and puts a stretch on the IT band. She did a good job because it didn't cause me any issues on Saturday's event. Below is the map, including the recorded speed and elevation profile of the event. We drove to Biggin in the Peak District, knowing the weather was forecast to be awful. Heavy rain and high wind. 26 mile would also be the furthest my gf has ever attempted. She knew I wanted to beat the time I put in last year, which was 5.5hours (even with the knee tear I had). I saw Anne and Vaughan, some friends I met on La Trans Aq in 2007 and intro'd them to my gf, then we were off. The weather was pleasant and stayed pleasant for the first couple of hours. Just a mile in and my gf started to suffer from knee problems, and after 3 or 4 miles wanted to quit at the first checkpoint. So, I fairly quickly I wrote off beating my time for getting her around the course. I decided to let her dictate the pace, and dropped in 5m behind her. We got to CP1 which was well stocked with refreshments. This event is very well catered, and has a great selection of food and hot and cold drink and every checkpoint, staffed by friendly helpers. My gf was suffering already by this stage, about 6 miles in, and took a dose of paracetamol and ibuprofen at the same time to ease the pain. The weather held well, as we headed through the dales and the largely flat course. Gradually we caught up and overtook most of the walkers. Just before CP2 is Lathkill Dale, which is pleasant running for the first half and then miserable rocky bad ground for the latter half. As we were just leaving the dale we went past one guy, a really miserable walker as it turned out, who piped up (and not in a joking way) and said "you are way behind, did you get lost of something? ", then rudely started saying something about us needing to consume "more Lucozade Sport drink to go faster". Obviously this made my gf feel even worse. She knew she was going slowly, but to have this especially portly ignorant bloke point it out was just uncalled for. I just ignored it, but felt like saying he needed to take a long hard look at himself, because he had a hours head start on us (he had started at 8am, and we started at 9am), and we overtook him before CP2! So he needs to try running himself (or even walking a bit faster), before he has a go at anyone else’s ability. Just plain rude and no need for it at all. Everyone else we went passed were really nice, pleasant and courteous. We thanked everyone who stopped and let us past etc. He was just one miserable bloke who was sick of being overtaken I assume. Shortly after the encounter with misery-guts we got to CP2 at Monyash community hall, where again a great spread of food was available, including hot cheese-filled oatcakes. I had one last year, but I wanted to get off quickly and not let my gf sit down. So we just grabbed a couple of cups of juice and some malt loaf, said our thanks to the lovely staff and were on our way. Just after, the Heavens opened, and it began to rain quite heavily. The wind had picked up 5 minutes before, so we had considered ourselves pre-warned and already put our waterproof jackets on. The next section is a gradual gradient for the next 4 miles or so. 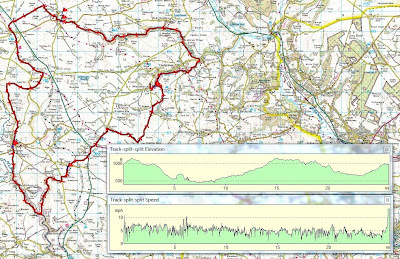 Initially on fields and farm tracks, then a brief downhill to join the Tissington Cycle trail which then heads steadily up. My gf was suffering quite a lot now, with frequent walking breaks to ease the knee pain. The driving headwind we were running into just made it all the more miserable for her. I just tried to make light of the miserable conditions with some totally inappropriate lines of songs that involved sunshine, or lovely days etc, and a few jokes. Despite the awful weather I was actually enjoying it. We left the Tissington trail and then headed over the fields to Hartington. The rain got heavier for a while, and then eased off just as we reached CP3, which was around the 20 mile mark. My gf got a few mouthfuls of hot coffee, whilst I ate a few snacks. I'd already eaten two sachets of baby-rice and a cereal bar so was well fuelled. The baby-rice (Ellah's Kitchen) really is a good find for these kind of events. Easy to take in and the best fuel for running. We thanked the staff again and were off for the last leg. My gf had more pain killers but wasn't able to run much of the last 6 miles; probably about 2 miles of it. I was pleasantly surprised to find that I wasn't tired at all. Ok, I wasn't running very fast, but I'd still covered over 20 miles. I think my recent training has really kick-started my fitness. I'm feeling good right now. If someone would have told me I had to run back to the start line at that point, you know I think I could have. Then again, I might have collapsed in a heap after 10 more miles! Like they say, if you are feeling good in an ultra, don't worry, it'll pass. We ran and walked through Dovedale and then took a sharp left up Biggin Dale. The terrain in Biggin Dale is all rocks and boulders and can be quite slow-going, but walking as we were it didn't matter. We came out of that last of the 6 dales, and I coaxed my gf into running the last half mile. It was gritted teeth and tears, but well done to her for it. It was her longest mileage ever, and likely most painful. She wasn't tired, just frustrated to be in a lot of pain. She clearly needs to get some attention to her knees. It took us 5 hours and 48 mins. Just over 3000ft of ascent and 26 miles. I'm pretty confident I'd have done it an hour faster, or more, under normal circumstances. Maybe I'll run the course again in the next few months and put that theory to the test. We had a meal at the finish (all included in the £7 entry fee! ), and there were lots of soups and some fruit for afterwards. Well done to the organisers for another well catered, well staffed, great value, and superbly organised event, that even the weather can't spoil. Anne and Vaughan had finished a long time before us, but were still there, so we caught up and chatted for over an hour. They had just completed and really enjoyed the Kalahari Augrabies Extreme Marathon, which I did last year. It was great to see them again, and I'll see them at some events in the next few weeks as well. My gf is now going to concentrate on getting her legs fixed and probably not join me on the events that I am doing in the near future. She doesn't want to slow me down and I don't want to injure her, so it's probably a wise decision. I'm sure we'll do some training runs in the new year together. I've got a reconciliation/recovery week ahead. Just 25 miles total, and I might drop next Saturdays 12 miles down to 10, depending on how I feel. I'll just listen to my body. I'm going to go now and hang upside down and ease my back which feels quite compressed and tight after all the miles in the last few weeks. My next event is Rudolph's Romp in 3 weeks time. I've not done it before, so I don't know what to expect. It's 23 miles long, and there's probably a few hills involved. That is about all I know! Well done to g/f for getting around and you for helping her. This sounds like one I have to try next year. Is it am LDWA event? I keep thinking I might have to join as I keep missing all the long local events. Hey Rich, just thought I'd pass this on. I used to dose up on ibuprofen when I was injured but having read the following I stick to paracetamol now and even then only if I really need it.